The Hippo offers you comfort and space In a garden setting. Our Hippo sized swimming pool provides hours of fun in the sun. How can we make your stay the best? Perfect! Just what we needed. We will be back next year. Hyppo is located in a very quiet and interesting part of the city, close to Richmond park and 15m walk to the main street. Staff was very hekpful and read to assist anytime. 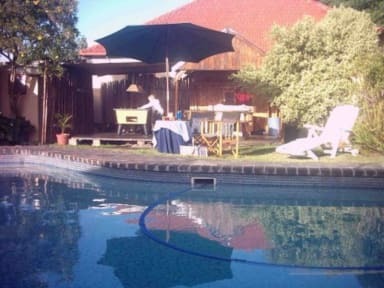 It is clean with a big dining room and kitchen, there is also a swimming pool in the compound. It is realy good value for money. Had a great experience here! The staff was really friendly and didn’t mind me asking a lot of questions about what to do and see and where to eat. Gave me loads of things to do. P.E. is a really beautiful city. The hostel was really quiet but that’s what I needed so it’s okay. All in all a great experience and a lot of fun! Quiet place, exactly what I was looking for. Swimmingpool is very nice. I can't give much of a review as I arrived really late and left early but the staff seemed super friendly, the place was really quiet but seemed ok. Big kitchen and sitting area. Pool wasn't clean but I had no intentions of going in it anyway. The place seemed out of the way but I didn't explore PE so that may not be accurate. I'd stay here again most likely. Cozy place with friendly and helpful staff. Staff helped arrange for day tours around the city. Rooms, toilets and bathrooms were clean and comfortable. Within walking distance to restaurants and bars, as well as some attractions. Basic facilities. Nice place to stop in PE. It was quiet when I was there but that was more the time of year and I still met some people to hang out with. Limited kitchen but ok and there is a lounge area to chat. 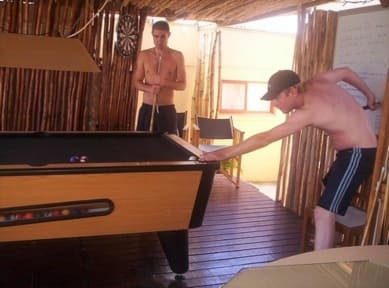 Pool is pretty big for a hostel too. This is a nice hostel and there are some nice bars and restaurants nearby.The place was very clean. The door was broken but fixing it was no biggie. I only spent two nights before my departure so I can’t really say anything about PE in general. I’d recommend to use an Uber to go somewhere. In general it can be said that it is a nice, rather quite place to stay at. Compared to other hostels the Hippo Backpackers seemed loveless and did not even have a bar. The best about it is its close proximity to Stanley Street along which a couple of nice restaurants and bars can be found. When I arrived there was no one besides the "night guard" and the corkroach which was walking across my foot. There was mold in the bathroom and the big dorm was also smelling like theres mold. The kitchen was not well equipped, the yard was not neat and a bit loveless. Its not the backpacker you'll expect and the presentation at HW does not correspond with reality. The braii area was nice and the couches comfortable. Your own plug will fit. The staff was kind and I survived.